A short sale is a sale of a property for an amount that is less than the amount of the loans that must be paid to satisfy all the mortgages on the property. The seller gets to avoid foreclosure and the lender avoids the lengthy and costly process of foreclosure, the substantial delay in securing the ability to resell the property and the likelihood of considerable deterioration in the condition of the property. 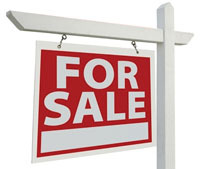 The advantages of a short sale are that the property is usually sold under market value; you have the ability to negotiate price and ask for closing costs to be paid by the bank; there is usually only one offer turned in at a time; and the property may be in good condition – including appliances – if the seller is still living there. The disadvantages of a short sale are the property typically sells in “as-is” condition; any offer is subject to the bank’s final approval; and it usually takes six weeks or more to hear a response from the bank. A foreclosure is when the owner’s right to a property is terminated, typically because of default. Often this involves a forced sale of the property at public auction with the profits being applied to the mortgage debt. Most of the properties in Beaufort County are purchased at auction by the lender in hopes of recouping some of the loan amount. The advantages of foreclosures are that the property is usually sold under market value; you have the ability to negotiate price and ask for closing costs to be paid by the bank; and there is usually a quick turnaround time to hear a response from the bank. The disadvantages of foreclosures are that the property typically sells in “as-is” condition; bidding wars can occur, which can cause the property to sell above asking price; and furniture and appliances can be removed. Both short sales and foreclosures present an opportunity to purchase a property significantly under market value… the trick is getting your offer accepted in a timely manner. This is where foreclosure properties have the biggest edge over short sales. Unlike a short sale where you first have to get the seller to accept your offer followed by lender approval, a foreclosure puts you directly in contact with a decision maker. Short sales can be worth the wait, just make sure you and your Realtor have researched the market to see that it is the best opportunity available. Short sales and foreclosures are worth a serious look, just keep in mind the best buys may not be distressed properties at all. Many times, the best buys are the ones where sellers still have equity in the property and are willing to negotiate based on property condition, incentives and price. One thing is for sure, with inventory being high, prices low and competitive mortgage rates, there is no better time to buy!